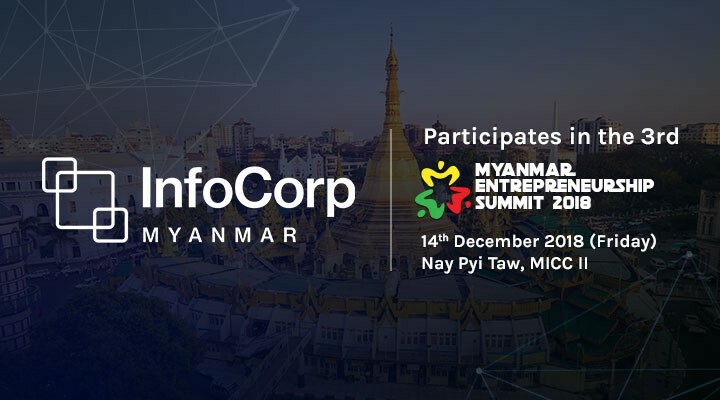 14 December 2018: InfoCorp Myanmar participates in the 3rd Myanmar Entrepreneurship Summit 2018 to showcase the Sentinel Chain solution. The event is organised by Myanmar Young Entrepreneurship Association and held at the capital’s Myanmar International Convention Center 2. The guest of honour gracing the event is State Counsellor H.E. Aung San Suu Kyi. Summit attendees include government representatives, corporates and young entrepreneurs from across industries. The event showcases exhibits and a host of topics and themes encompassing entrepreneurship development, digital technology, social enterprises and financial topics. Event delegates can check out Sentinel Chain at the InfoCorp Myanmar booth located at #A1, and meet the team, including Mr. Roy Lai, founder and CEO of the parent company, and U Zeya Thura Mon, managing director of InfoCorp Myanmar. “We are very happy to support Myanmar Young Entrepreneurship Association for the second consecutive year in its efforts to build a dynamic entrepreneurship ecosystem in the country.” Zeya Thura Mon. “We hope that Sentinel Chain project will inspire many young entrepreneurs, and my advice to all entrepreneurs is that we must have unwavering tenacity to succeed in the face of pressures and must be versatile to change strategic course quickly.” Roy Lai. The association’s main objective is to empower young entrepreneurs and assist in creating a vibrant entrepreneurship ecosystem in Myanmar. As of today, MYEA has organised and participated in numerous events and activities with a variety of organisations both locally as well as internationally. Our members include an impressive pool of young entrepreneurs covering all sectors of the industry, with diverse abilities and expertise. We are passionate about the growth and development of entrepreneurship in Myanmar and have a culture of a Community of Friends. We stand ready to cooperate with others in the pursuit of growth and development in Myanmar and the region. At present , MYEA has over 1,500 members. In addition, the gender ratio is balanced amongst members. InfoCorp Myanmar, under the umbrella of InfoCorp Technologies Pte. Ltd. is a fintech company that provides the infrastructure to accelerate financial inclusion to unbanked and underserved communities through the use of blockchain technology. It designs solutions for small bank consortiums in emerging countries to facilitate inter-bank transactions using distributed ledger technologies and provides consultancy services to clearing house and central banks on implementations and testing of real-time payment systems, and also to corporate clients on implementations and operations of distributed ledger technologies for production use. Sentinel Chain is an InfoCorp project, a blockchain-based international marketplace for cross-border financial services and the world’s first platform to accept the use of livestock as collateral. Taking a unique approach to the last mile problem of financial inclusion, the Sentinel Chain model establishes livestock provenance through the creation of livestock insurance on blockchain — the registration of livestock provenance on blockchain provides the unbanked with a new opportunity: the real possibility of accepting livestock as ‘collateral’ for loans. Sentinel Chain is a project by InfoCorp Technologies.